Henley came into being in the mid-1940s as the Administrative Staff College. In the 1980s, the school took on the name Henley-the Management College and began its significant upward trend in visibility and respectability. After being awarded a Royal Charter in 1991, the school again changed its name, this time to the Henley Management College. Less than two decades later, after having accrued triple accreditation, the Henley Management College merged with the University of Reading and was renamed the Henley Business School. The Henley Business School is a triple-accredited institution by the AMBA, EQUIS, and AACSB. The University of Reading’s full-time MBA offering takes place in Whiteknights Park, Reading’s primary campus. The new, visually-striking Business School building opened in 2009 and provides extensive resources and support for business students at Henley, including a dedicated Academic Resource Centre, a conference-standard lecture hall, and dozens of classrooms and study spaces. 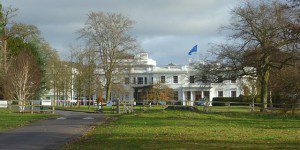 The Executive and Flexible Executive MBA programs are based on the original Greenlands Campus on the banks of the River Thames in Henley. The Greenlands Campus is especially equipped for conference activities and is well-suited for the more practical business content of the Executive MBA program. The University of Reading campus is just a 25-minute train ride from Central London, which has access to the city’s multiple airports. The Henley Business School features more than 150 faculty members who hail from 18 different counties. . These professors have a diverse range of geographic and academic specialties including International Business and Strategy, Business Informatics and more. In 2015, Henley was rated first among UK schools for percentage of female faculty by the Financial Times. Henley Business School as a whole includes more than 7,000 students from around the globe. The global alumni network has more than 70,000 members in 150 countries. Similar to many of its peer programs, University of Reading offers full-time, Executive, and Flexible Executive MBA programs. The full-time program caters to younger, but still experienced, professionals looking to advance in their careers. The Executive programs take place over a longer period of time, allowing more experienced managers to gain business knowledge while staying employed in their current positions.